I found this example of a large company really missing the boat on how to encourage conversions on a landing page. At the stage shown below, the customer has made their way through the “compare plans” program and ended up on a program of interest. If that plan is the one they want, there is no way to initiate the purchase or even send a query to a sales rep with your choice intact. You must go through a generic inquiry form or back to the compare page. 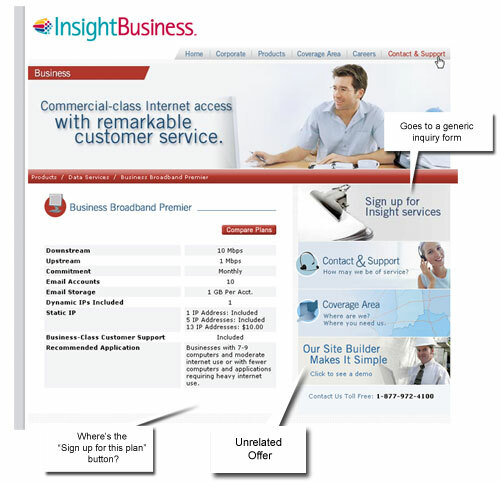 In addition, this critical page in the sales cycle has unrelated content on it about their website hosting service. Every page of a site like this should have a way to complete the sale and if they’ve shown you which product they’re interested in, you should not try to cross sell them on a unrelated or loosely-related feature. You should assume that each page can be the last page a customer sees in even a long site visit. If they are ready to engage, remove the noise and give them a way.